We are fully aware of the issues associated with the sourcing of palm oil, and we have taken this into account when sourcing our ingredients, in particularly the vegetable oils and fats of palm origin. Unfortunately, at this moment in time, replacing palm oil is not the right solution to address the environmental and social problems associated with oil palm cultivation for two reasons. Firstly, replacing palm oil with other types of vegetable oil would mean that much larger amounts of land would need to be used, since palm trees produce 4-10 times more oil than other crops per unit of cultivated land. This would result in serious environmental damage, with the risk that more forests would need to be converted into agricultural land. Secondly, in producing countries, millions of farmers and their families work in the palm oil sector. Palm oil plays an important role in the reduction of poverty in these areas. Stopping the production of palm oil altogether would create significant problems for these people. At the present time, the best and most sustainable solution is to switch to sustainable palm oil rather than to other vegetable oils. We are pleased to confirm, that since August 2014, Wholebake (who make our products in their factory) has been a registered member of RSPO – an international, multi-stakeholder organisation that has developed sustainability standards and put in place an independent process for verifying production and supply chains. Details of our membership can be found on the RSPO website. 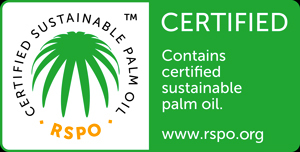 This means, that we are fully committed to sustainable sourcing, and work is ongoing with our suppliers to ensure that all of the palm oil used in our products is sourced from RSPO certified supply chain. The RSPO was established in 2004 to promote the production and use of sustainable palm oil for people, planet and prosperity.